Showing at The Canberra Theatre Centre from August 6 – 9, Of Mice and Men is the dramatic retelling of John Steinbeck’s famous novella of the same name. 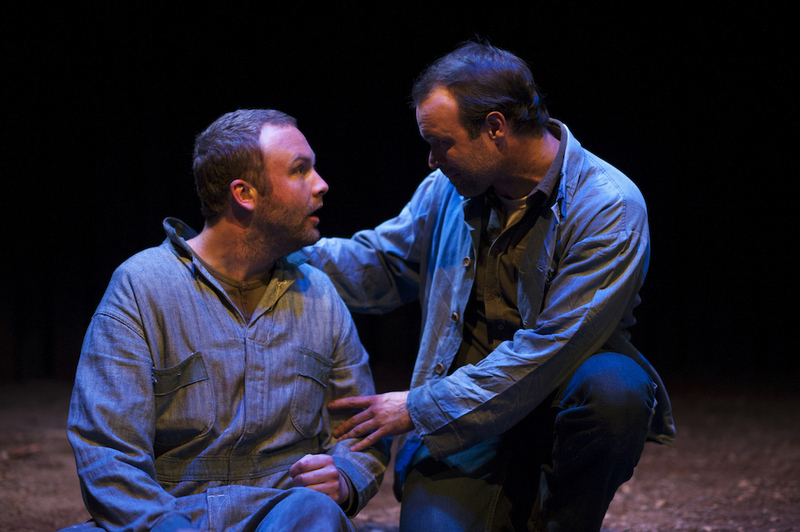 Billed as a “compelling tale of friendship and survival”, the production captured the grittiness of Steinbeck’s original text and presented an exploration of dreams, delusions, sacrifice and consequences. Directed by Iain Sinclair, Of Mice and Men is a production of Sydney based A Sport for Jove Theatre Company and features a strong cast of Anthony Gooley (George), Andrew Henry (Lennie), Laurence Coy (Candy), Christopher Stollery (Slim), Anna Houston (Curley’s wife), Andre De Vanny (Curley), Charles Allen (Crooks), John McNiell (Carlson), Tom Stokes (Whit) and Terry Serio (The Boss). Although all of the performances were strong, Andrew Henry’s portrayal of Lennie was particularly so, playing the character with great empathy and humour. Lennie is always going to be a fairly one-dimensional character in the sense that his motivations are clear and he doesn’t develop over the course of the story, however Henry is injects a surprising level of complexity that makes the story’s culmination even more tragic. Anthony Gooley’s performance of George was also strong, but did not completely capture the most interesting thing about George as a character, which is his shift in outlook as the story progresses. Beginning as somewhat of an idealist, as the story progresses George faces the gradual realisation that his and Lennie’s dreams of a better life together are just that – dreams. The world in which they dwell is far too cruel for someone as vulnerable as Lennie, despite what George may try to tell himself. Other notable performances include Anna Houston as the flirtatious Curley’s wife, Christopher Stollery as the well respected Slim, Charles Allen as the embittered (and rightly so) Crooks and finally Andre De Vanney as the small and nasty Curley. Also standout was the set design by Michael Hankin and (Designer) and Georgia Hopkins (Assistant Designer). Interestingly for a working farm, all the action takes place in the interior of the men’s sleeping quarters or the barn. This highlighted the human relationships as the unfolded, particularly between Lennie and George, and Lennie, George and Candy. It’s always interesting to see seminal works of literature presented as a stage production – if done well, the production retains the work’s original integrity, whilst offering unique vantage points and new ways of understanding. It is here that Sinclair triumphs, remaining faithful to the script and story, yet highlighting Steinbeck’s wry sense of humour which can sometimes get lost in his intense and tragic narratives. The richness of Steinbeck’s writing and depth of storytelling is not lost in this production, but the emotional weight of the story does not become apparent until the very end. When the tragedy hits, it hits like a tonne of bricks; the final scene is brilliantly executed and it is in this moment that the magnitude of the story, and Lennie and George’s relationship, is realised. Of Mice and Men was a well executed and highly professional performance that did justice to Steinbeck’s novella and brought to bright relief the harsh everyday reality that was experienced during the grips of the Great Depression. Although published 78 years ago, Of Mice and Men is a prevailing tale of hardship and morality. It questions our treatment of those less powerful than ourselves and implores us to act with kindness and compassion, regardless of the situation. This entry was posted in Arts, Theatre and tagged canberra, Review, theatre. Bookmark the permalink.